This documentary video discusses the impact of standardized testing and the pivotal role of the arts in creativity and problem solving. The goal of this video illustrates that the arts really can have a voice in education. Pencils, a traditional art media are transformed into the "medium is the message." Your contributions will be a voice for the value of the arts in education. Do you believe that art can be a message for change? The merit of making a video is that it is such an effective vehicle for sharing information especially on the internet. The power of the internet and video is that it can reach a wide audience with a compelling message. 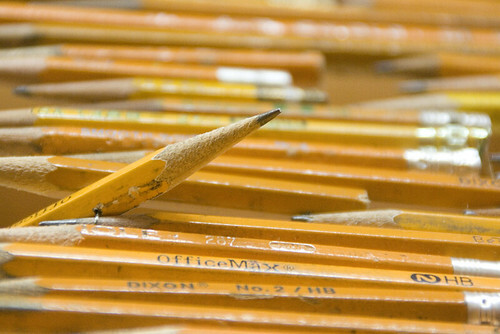 Pencils are a symbol and metaphor. For the installation, Pick Up Your Pencils, Begin, thousands of pencils were sent by people from all over the world, but mostly the United States. The bell curve of pencils 28' wide and 15' tall symbolizes the emphasis on standardized tests that is affecting our education system. The arts and hands on skills are being squeezed out by the relentless focus on standardized test scores, which only measure easily quantifiable knowledge. The arts can teach creativity, problem solving, and critical thinking. The arts can be integrated with all subjects and engage students in project based learning. Pencils, the primary raw material in the sculpture, Pick Up Your Pencils, Begin, will be a recurring visual throughout the video. Pencils can be used to fill in bubbles in standardized testing or as tools for creativity, sketching, thinking and writing. 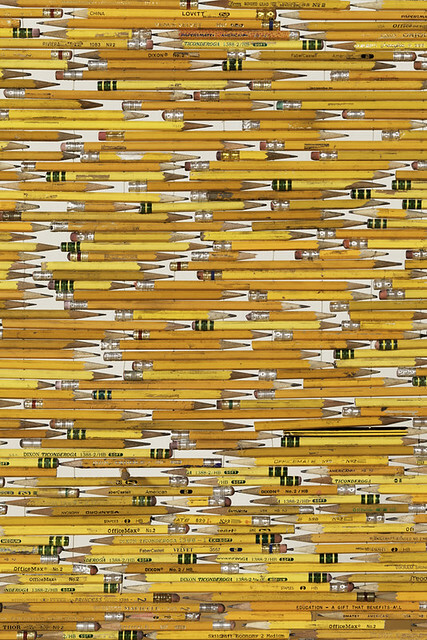 The thousands of pencils in this sculpture represent the many individual students affected by standardized tests. In the proposed video, fabrication and assembly images from still photography and video will offer insight into the creative process. THIS ARTWORK Pick Up Your Pencils, Begin was featured in an two page spread in American Craft Dec/Jan 2012 issue. 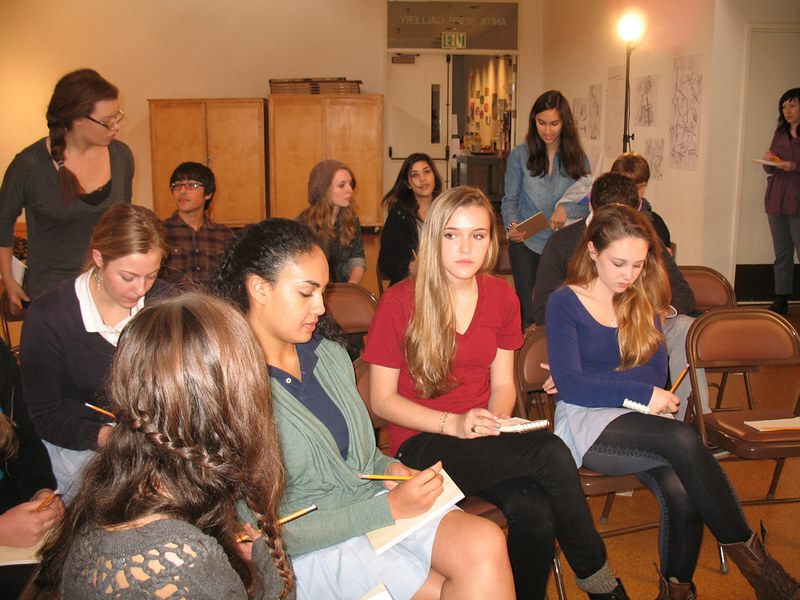 In addition, the project received a $5,000 grant from Applied Materials Foundation of the Arts Council of Silicon Valley to organize and video tape a program with local high school students.The students gathered together to discuss the impact of standardized testing on their education. More information and links can be found on my web site at: http://www.harriete-estel-berman.info/sculpt/pencilPage.html. 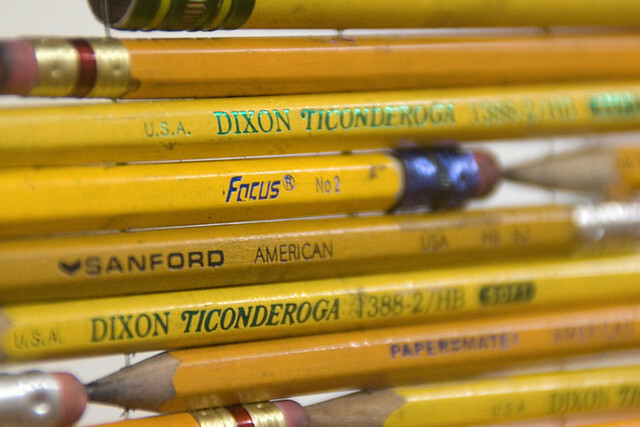 The short video documenting the Pencil Symposium will be completed by April 30. If there are some good "nuggets" or stories from this video I will add it to my KICKstarter PROJECT video. During the video taping of the Pencil Symposium two math teachers from Castilleja School explained the math principles in the bell curve. It is very exciting to hear the math teachers so engaged with the artwork. Student responses to the artwork Pick Up Your Pencils,Begin can be found on my web site. I will add a few images here very shortly. The bell curve of pencils represents the monolithic aggregation of student scores from standardized tests. In our data driven society, the tests measure only a few skills. Less obvious is the motivation for school districts to constantly raise test scores. Consequently, teachers and curriculum increasingly focus on performance on standardized testing. Since the skills of the arts and hands on learning, including creativity and problem solving are not measurable by a single number, their role within the educational system is devalued. Focusing on the creative process demonstrates especially the value of the arts in education. This work of art makes a political statement about how art in general is undervalued because the arts can’t be summed up or measured by a single number. As we reinvent our educational system away from the factory model of the early 20th century to the new learning models of the 21st century, the mission statements of every teacher, every school, and every school district refer to the need for creativity and problem solving as essential job skills of the future. 3) reactions to the completed work (experiencing the final work’s huge size, visual impact, textured details, and ethereal thinness, and interviews with students, parents, faculty, and other stakeholders in education). Super amazing thanks to everyone who has donated so far. Every donation brings me a small step closer to my goal. Video is an expensive medium. Camera work and sound alone require a minimum of two people. Editing is an art in it self. requiring hours and hours of careful detailed work. Creating the story and message in the the video is what it is all about. Custom music helps make my video unique. It also means that my music will be copyright free, and not used by any one else creating an unique feel and sound for this video. Arts in education is a powerful topic. There is no video that explores the value of arts in education. The most recent video about education is "Waiting for Superman" which featured a completely different conversation about education. Interest in the project is expanding as I look for organizations to support this video along with corporate sponsorships. To early to say anything out loud right now, but I hope to share more information soon. If you can't make a financial contribution, can you share this link with all your friends, artists and makers in your community. I know your wondering what I will do if I don't reach my KICKstarter goal. RIGHT? When this KICKstarter project, began, I thought it would be the most embarrassing prospect if it did not reach the goal. Now the realization is that I have leaned a lot about KICKstarter and video projects in general. This experience is learning to jump another hurdle in life. This video project may go another route completely, or I will try KICKstarter with a better introductory video, and savvy outreach. Stay tuned. PENCIL MAKES A POINT POSTCARD . . . . . . . . . . . . . . . . . . .* * * * * * * . . . . . . . . . . . . Signed postcard by Harriete Estel Berman represents your voice for arts in education. Even the smallest donation means a lot to make this video project possible. Everyone will be acknowledged in the video credits as a supporter for art in education. ARTS IN EDUCATION ADVOCATE . . . . . . . . . . . . . . . . . . . . . . * * * * * * * *. . . . . . . . . . . .
installation, Pick Up Your Pencils, Begin. Use these postcards as a voice for arts in education! Mail them to your school district, senator, congress person or governor. Support a project that says "The arts belong in K-12 education."
. . . . . . . . . . . . . . . * * * * * * * *. . . . . . . . . . . . . This 11” x 17” poster in full color is perfect for the classroom. 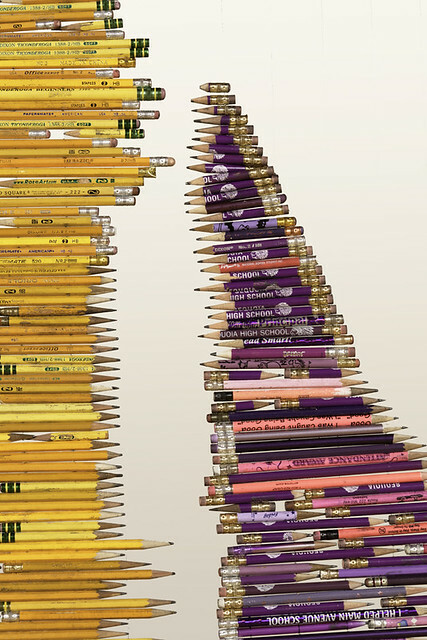 A full color image of the bell curve pencil installation Pick Up Your Pencils, Begin demonstrates your belief that the arts can teach creativity and problem solving in education. Mailed in cardboard tube. DVD copy of the completed documentary video about Pick Up Your Pencils, Begin and the impact of standardized testing on education while marginalizing the arts and crafts. 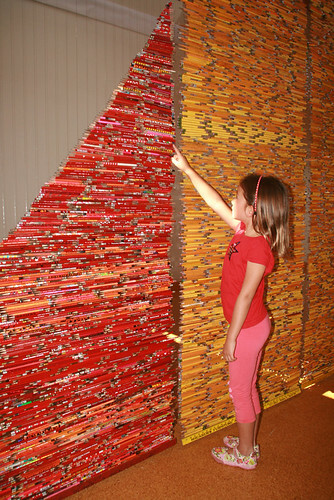 The artwork (a 28-foot-wide, 15-foot-tall shimmering curtain of pencils in the shape of a bell curve) will function as inspiration and metaphor. 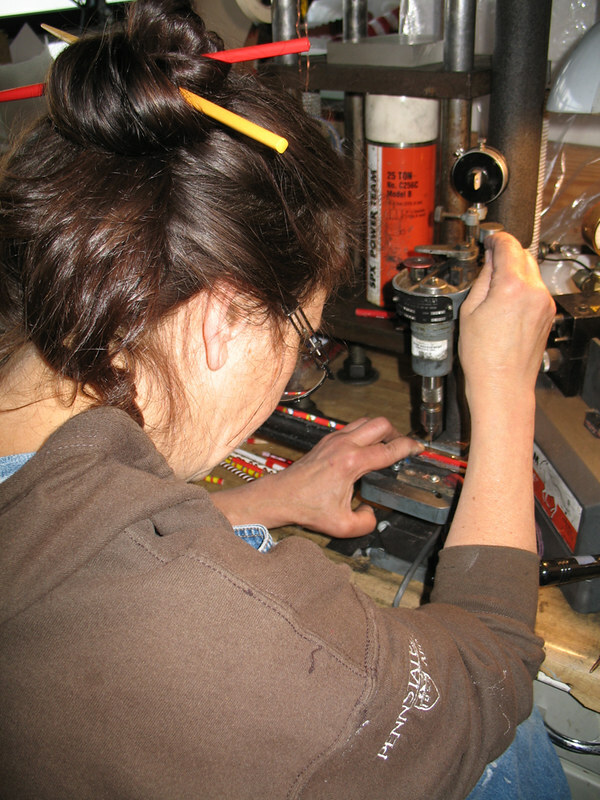 Intimate details of the hands on assembly will be included along with commentary from experts to high school students. BELL CURVE PIN Special Edition & DVD . . . . . . . . . . . . . . . . . * * * * * * * *. . . . . . . . . . . . This special edition Bell Curve Pin is a custom made pin with bell curve image specially made for this project from recycled game boards by Harriete Estel Berman. Each pin is signed by the artist. I will mail the pin in April 2012. In addition, I will mail a signed copy of the video DVD when it is finished by April 2013 or sooner. The documentary video is about the impact of standardized testing on education while marginalizing the arts and crafts. 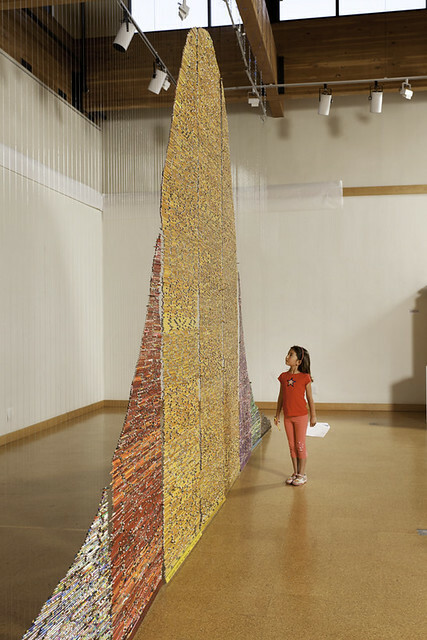 The artwork titled, Pick Up Your Pencils, Begin (a 28-foot-wide, 15-foot-tall curtain of pencils in the shape of a bell curve) will function as inspiration and metaphor. Intimate details of the hands on assembly will be included along with commentary from experts to high school students. PENCILS MAKE A POINT SPECIAL OFFER . . . . . . . . . . . . . . . . * * * * * * * *. . . . . . . . . . .
----DVD of the complete video April 2013 ..
TZEDAKAH ENVELOPE ART . . . . . . . . . . . . . . . . . . . . . . . . . . * * * * * * * *. . . . . . . . . . . This custom made envelope from post consumer recycle tin cans by the artist will look like a real paper envelope except made out of colorful patterned tin. Each envelope is unique, hallmarked and signed by the artist. 50 similar envelopes are owned by The Jewish Museum in New York as part of their permanent collection in an artwork by Harriete Estel Berman. The envelope represents putting your financial contributions to this project in an envelope. TO VIEW AN EXAMPLE OF THIS REWARD - COPY AND PASTE THIS LINK: http://www.harriete-estel-berman.info/sculpt/pencilKICKSTARTERrewards.html . . ....Also copy of the DVD when it is finished by April 2013. SUPPORT THE FLOWERING of the ARTS . . . . . . . . . . . . . . . . * * * * * * * *. . . . . . . . . . . . For this level of participation, you can choose a one of a kind flower pin from recycled tin cans by Harriete Estel Berman. Metallic Gold Flowers to brilliant & colorful patterns. ...Also copy of the DVD when it is finished by April 2013. EVERYONE WILL KNOW YOUR NAME . . . . . . . . . . . . . . . * * * * * * * *. . . . . . . . . . . . . Custom made one of a kind name badge with lettering from recycled tin cans by Harriete Estel Berman. Limit of 10 letters. Additional letters or last name possible for additional fee. Make a lasting impression! Never wear a generic, hum drum sticker name tag again. Each name tag is original but you can see previously made custom name tags. TO VIEW AN EXAMPLE OF THIS REWARD - COPY AND PASTE THIS LINK: http://www.harriete-estel-berman.info/sculpt/pencilKICKSTARTERrewards.html. ...Also copy of the DVD when it is finished by April 2013. REUSE, RENEW SENTIMENTAL JEWELRY . . . . . . . . . . . . . . . . .* * * * * * * *. . . . . . . . . . . . .
Tour my overflowing studio space and try your hand at making your own pin/necklace from found materials. Bring sentimental bits from your junk drawer, old or broken jewelry with sentimental attachment, or a treasured tin can from a relative. Precious and non-precious it doesn't matter. No previous experience with tools required. Bringing your own found materials is fun and personal, but this is not necessary. I have a lot of material for you to pick and choose. About a two hours project. Bring a friend and experiment together. TO VIEW AN EXAMPLE OF THIS REWARD - COPY AND PASTE THIS LINK: http://www.harriete-estel-berman.info/sculpt/pencilKICKSTARTERrewards.html....Also copy of the DVD when it is finished by April 2013. PATRON OF THE ARTS MEET THE ARTIST . . . . . . . . . . . . . . . * * * * * * * *. . . . . . . . . . . . Gourmet lunch or dinner for 4 by Harriete Estel Berman. Studio visit and copy of the DVD when it is finished by April 2013. You'll love my studio, my cooking and my passion for dishes! Check out my Facebook albums of Thanksgiving table themes to know the evening will be memorable.